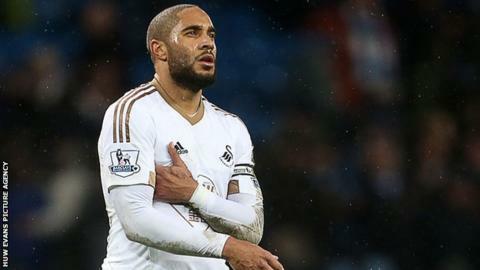 Swansea defender Ashley Williams says he has "lost a mate" after Garry Monk's sacking as manager. Monk left the Swans after a run of only one win in 11 Premier League games. Williams and Monk had been together at Swansea since 2008, first as team-mates and latterly as captain and manager. "It's been even more difficult than a normal kind of situation because he's a mate - you feel like you have let him down," Williams told BBC Radio 5 live's Wednesday Night Club programme. "Then he goes so you have lost a mate that you see every day. It's just tough really. "No football player likes to go through this situation - it's even worse because we haven't found ourselves like this for such a long time. "You get used to doing well and it's a shock at times like this." Swansea are one place above the relegation zone, with first-team coach Alan Curtis in temporary charge as chairman Huw Jenkins searches for a replacement for Monk. Jenkins is in South America, with Argentina's Marcelo Bielsa the odds-on favourite. Bielsa, 60, a former Argentina and Chile boss, resigned from French club Marseille in August and is unattached. Williams acknowledged that he and other senior players had been trying hard to correct Swansea's loss of form. Monk had guided the Swans to a highest Premier League finish of eighth in his first full season in charge. They started this season in similar form, drawing at champions Chelsea on the opening day before beating Newcastle United and Manchester United at home in a four-match unbeaten start. But Swansea's form then deteriorated rapidly. "We did so much talking and meetings and phone calls just trying to figure out what it was, what's different from the start of the season and last season," added Williams. "In the end we ran out of time with that manager. "It's quite clear what we need to do, what we need to get back to, so that's the positive. "We need to stop the talking and get back to passing the ball, keeping possession, creating chances, scoring goals and defensively pressing the other team, which is what we stopped doing. "That's what we will try and do going forward - keep sticking together and working as hard as we can."